The murder of Indian author Sushmita Banerjee in Afghanistan was “definitely the work of the enemy” of the friendly ties between New Delhi and Kabul, the Afghan envoy said here Saturday in that country’s first public reaction to the killing. During a talk at the Press Club of India, Afghan Ambassador Shaida M. Abdali said he was “very saddened” by the Sep 5 killing in which “no real Afghan” would have been involved. India had said Pakistani Taliban militants had come from beyond Afghanistan’s border to murder the Bengali author in Afghanistan’s Paktika province. “No real Afghan would kill. There were conflicting reports about some family issues. The investigation is on,” Abdali said. He said India should not look askance at the killing. “What we should concentrate on is that India should not look askance at the killing, a killing that could take place on a soil that has so much love for (India). Definitely, it would be the work of the enemy of the two countries, and that is exactly something that we have been trying to stop,” said the ambassador. “A party that does not want the good relationship (between India and Afghanistan) to remain, and that we are trying to stop,” he said. India has said that the plan to kill Banerjee was “hatched in Pakistan” and that three militants who worked with Akbar Musafir, the local commander of the Afghan Taliban in Paktika, were involved in the killing. Abdali also gave reassurances about his country looking after its Sikh and Hindu minorities. “Afghanistan will only be complete as a nation if it has all its segments of society, including its Sikhs and Hindus,” he said. He rued that thousands of Hindus and Sikhs have had to flee due to Taliban pressure, saying “there was a design in that”. He said the single seat in the Afghan parliament reserved for its Hindu and Sikh minorities was “an example of how the parliament respects Hindus and Sikhs”. Abdali said the special quota “will not be taken away by anyone”, and hoped Afghanistan would see the return of Sikhs and Hindus. J. K. Sharma, a Sikh magician at his shop in Shor Bazaar in Kabul, Afghanistan, on Aug. 7. J K Sharma, a large Sikh man in a black turban, works out of a small room lined with jars and herbs in the ruined and dusty Shor Bazaar in Kabul. 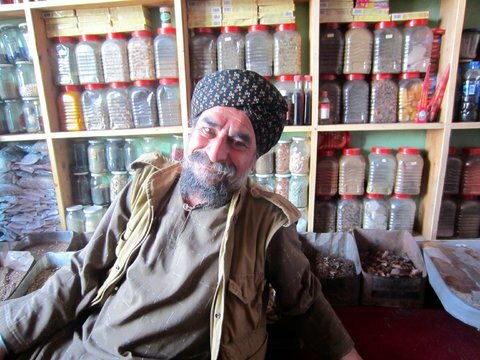 In a war-ravaged country where miracles are in short supply, Sharma makes a living as a magician, providing advice and talismans to Muslim Afghans for a fee. On an August afternoon, Sharma, who refused to divulge his real name, stroked his salt-and-pepper beard as a nervous Afghan man sought help to getting the girl he loved to marry him in the face of parental objections. Sharma stared intently at the two dice with markings after he had rolled them a few times. “Don’t worry, you will get the girl,” he declared with a broad smile. The magician charged the man 1,000 Afghan rupees, or $17, for an amulet. Shor Bazaar, once a famed center for musicians and a home for businesses run by Afghan Hindus, is now the haunt of self-proclaimed magicians who are mostly Afghan Sikhs. Fortunetelling is one of the few occupations left for the Sikhs, who are on the verge of disappearing from Afghanistan, along with the Hindus. Community leaders of these two religious minorities estimate that 35 years ago around 100,000 of them lived in Afghanistan. After three decades of fleeing from conflict to countries like India, Canada and Germany, only 3,000 are left. The majority of the 300 families remaining are Sikhs. Sharma had also left with his family to seek asylum in India, but he returned to Afghanistan after failing to make a living in their new home. Every month, he remits a big part of his earnings to his family in India. Most of the Hindus and Sikhs who remain in Afghanistan are weary of religious discrimination and absence of economic opportunities, and they are hoping to leave their country as anxieties grow about their prospects after American troops withdraw from Afghanistan at the end of 2014. In September, for instance, president Hamid Karzai had to issue a legislative decree to reserve a single seat for Sikh and Hindu Afghan nationals in the lower house of Parliament after lawmakers refused to do so. Among those trying to get out of Afghanistan is Ram Prakash, who owns the oldest photography shop in Kabul established in 1955. With most of his family already in India, the elderly Prakash is only waiting for a good offer to sell his business, but none has come so far. “There is no point being emotional about it. Our shop is a famous institution and that also makes us targets,” he said. Under the Taliban regime from 1996 to 2001, Hindus had to identify themselves by yellow markings on their forehead or wearing a red cloth. On a late afternoon in August, a few people lazing around the Asamai temple grounds in Kabul shared different memories of the time. One man recalled that Hindus with a yellow dot could get away without a beard but that terrible retribution was unleashed on a Muslim who shaved. Another said that he was forced to convert to Islam by the Taliban and marry a Muslim woman because he was seen speaking to her in a shop. In recent years, some Afghan Hindus and Sikhs have made their way back home, at least temporarily because of financial pressures. Most of those who returned to find work left their families behind. But a few like Balram Dhameja, the caretaker of a Hindu temple in Kabul, came back with their daughters and wives. Dhameja returned to Afghanistan with his family after 14 years because he couldn’t make a living in India. Dhameja said that he served in the Afghan police force when the country was led by the Moscow-backed president Mohammad Najibullah, who was toppled in 1992 by the America-backed mujahedeen, and hanged from a lamp post by the Taliban four years later. Refugees say that India is slow to grant them citizenship, and without it, they have a difficult time finding work. A 2009 report from the Centre for Civil Society in Delhi found that 90 per cent of the 9,000 Afghan refugees in India were from the religious minorities, and out of them only 1,000 had been granted citizenship. An additional 3,000 had been waiting for 12 years. For over a decade, Dhameja sold tea in Faridabad on the outskirts of Delhi, but the family of five found it hard to cope with the expenses. In 2006, the rent of their apartment had gone up to Rs 3,000 from Rs 500 in 1992. They left in 2006 after his tea shop was demolished in a government raid on illegal constructions. But in the long-term, Dhameja said he wanted to head back to India because he saw no future for his children in Afghanistan. He was trying to save money to send his 18-year-old son to find work in Germany in the next few months. Fearing harassment, the majority of Hindu and Sikh families don’t send their children to schools in Afghanistan, especially the girls. They have for a long time demanded exclusive schools to be set up for their children. Anarkali Kaur Honaryar, the only Sikh female in the Afghan Parliament, explained that such primary schools are running in Kabul and Jalalabad for the past two years but that it wasn’t possible to set up exclusive schools in provinces where only two or three families are staying. For such places, Honaryar said, the Hindu and Sikh parents want their children to be registered in a government school until the sixth grade, or age 12, while being tutored privately in the Sikh temples. “We want the young ones to be protected from any kind of teasing. But teenagers can take care of themselves better,” she said. Even now when the country had more schools, Honaryar said that Hindus and Sikhs did not take education seriously. Instead, they had their girls married off by the age of 14, often driven by fear for their security, and sent their young boys to work. The 36-year-old politician, who grew up in Khost Province said that her own family, who had studied in Afghanistan before and after the Taliban, was an example that education could be pursued despite obstacles. When the Taliban took power, Ms Honaryar had finished the 12th grade and was teaching in the local primary school while starting her first year studying mathematics in the government college of the country’s north Baghlan province. Her father, an engineer, was fired from his job because only Muslims could work for the Taliban government. Honaryar left college and donned a burqa to attend vaccination courses at the local hospital in Baghlan. When they moved to Kabul, her sister privately tutored boys and girls of all religions. Though the Taliban issued several warnings, Honaryar recalled, they never used violence to stop the classes. And after their rule ended, she got her degree in dentistry from Kabul University and then joined the Afghan Independent Human Rights Commission. President Karzai later chose her for Parliament. Her sister pursued law and her brother took up medical studies. Harminder Kumar is a Hindu boy in Kabul who insisted on being sent to a regular school despite his family concerns. Kumar, 16, studies in the fourth grade because he has disrupted his schooling several times due to harassment. “I want to be a doctor. Going to a school with proper teachers is the only way of getting quality education,” he said. Despite the bleak prospects that face Sikhs and Hindus in Afghanistan, a handful of these minorities have endured three decades of conflict to stay in their home country, having forged relationships with Muslims that eclipsed religious persecution. One Sikh family lives quietly in a fortress-like home with high mud walls on the outskirts of Kabul. Guarding it is a Muslim family headed by Haji Faizal Rehman, who has served as chief custodian of their property and 24 hectares of farmlands for 17 years. The Muslim family is left in charge when the Sikh family moves to India during the Afghan winter months. A large man with a bushy beard, Rehman said that in his employer’s absence, he had warded off bribes and intimidation by local mafia groups attempting to take over the land. “We have a special bond of trust between us. I would never work for anyone else,” he said.